If you have been trying to follow a Ketogenic diet, you may be a little overwhelmed. Information overload, right? A Ketogenic lifestyle has so many benefits…endless benefits, really. I have never felt better, and highly recommend this lifestyle to anyone who wants to get healthier, lose weight, have more energy, better digestion….pretty much anything! However, I know some people get stuck in the research phase and don’t know where to start. They think their diet has to be perfect right from the start, and get upset if they mess up. Well, guess what? No one is perfect, no diet is perfect, and we all mess up. Think of this as a lifestyle, not a diet. Diets are temporary and you don’t want temporary. You want to make changes that are going to fit in with your life and be sustainable for the long haul. 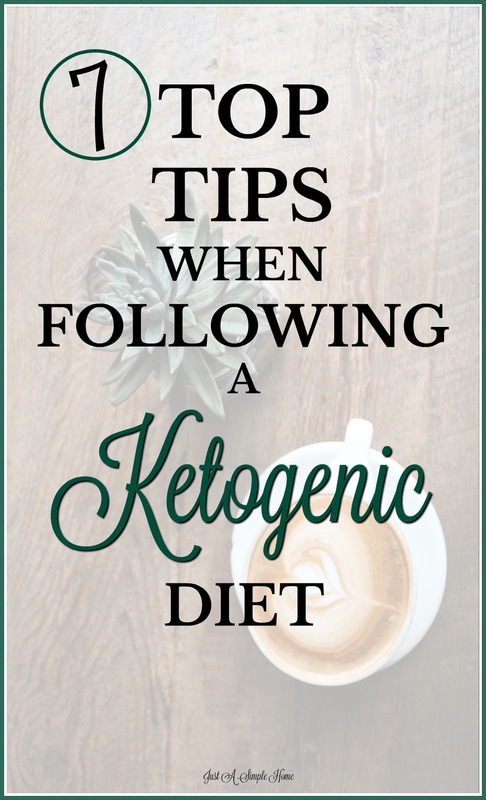 So, I am sharing my top tips when starting to follow a Ketogenic lifestyle and I hope they can encourage you to keep going. START TODAY – We already discussed information overload. You can do all the research you want, but if you get stuck in the research phase and wait until things are ready, you will never start! Make the decision to start today, no matter what day it is or what time of day it is. You can learn as you go, trust me. EAT MORE SALT – Salt has been demonized for years. Research shows if you don’t limit salt intake, people tend to eat around 3-6g of salt a day. A Keto diet is anti inflammatory. If you have inflammation in your skin, joints, your gut…pretty much anywhere…this causes swelling. Your cells are holding onto excess water. When you start an anti-inflammatory diet, like Keto, the excess water comes out in your urine and the swelling disappears. Now, salt is also excreted in your urine. In the first few weeks of starting a Ketogenic diet, you will lose all that inflammation, which means all that extra water, which also means your body will lose more salt than usual. So, you need to make sure you replace the salt you are losing in your diet. Pink Himalayan sea salt is a great option to use. GET RID OF TEMPTATIONS – This should be obvious, but it is amazing how many people tell me they just can’t stop snacking on things they know they shouldn’t snack on. Well, I then ask…how did the bag of chips get in your house? Do you see where I’m going with this? If you don’t buy the foods that you know will tempt you, you won’t be tempted. I know my husband will eat a whole bag of chips, and I’ll eat way too many chocolate chip cookies. So, those things don’t come into our home! My husband makes a lunch for work and I pack food when the kids and I are out for the day. I also drink Exogenous Ketones before we go to an event or something I know I’ll be tempted at and it helps curb my cravings and appetite. EAT UNTIL YOU ARE SATISFIED – My parents used to make us finish every last bite on our plates. There’s enough research now to show that this tends to backfire on well meaning parents. I don’t make my children finish their meals because I want them to learn to listen to their bodies. Because we eat a high fat, low carb diet, our brains register that we are full and satisfied more quickly. Eat until you are full and satisfied and don’t worry about calories or portion size. Feel free to go back for seconds if you need to. When you eat enough fat, you will trigger the satiation hormone in your brain that tells you are done. There’s so much freedom that comes from this! PREPARE FOR LONG TERM – Do not expect to reach your goals in the first few weeks. Yes, you will likely lose weight, but your initial weight loss is fluid, not fat loss. You are reducing inflammation and getting rid of the swelling and water weight that comes along with that. TRY NEW FOODS – Learn to eat new things! I know this is hard for many of us. But you want this to be a lifestyle, right? You don’t want to get bored of eating the same five foods and then quit. Try new cuts of meat, new veggies etc. Make it a game with your kids! The human palate is retrainable, so keep trying new foods and you’ll be surprised at how your taste buds respond. You don’t need to have an unlimited budget to get creative either. Here are some Keto friendly foods you can use on a budget. LET GO OF THE GUILT – This is a tough one, but so important. Give yourself some grace. If you have a not so great day of eating, don’t feel guilty. It happens, it’s life. Most days, I’m more low carb than strict Keto, and I’m ok with that. Our ancestors followed a Keto diet, and they cheated too! Just make yourself aware and focus on how going off track made your body feel. Then, get back on track. If you need help, you may want to try Exogenous Ketones. They work wonders at putting your body in ketosis, helping your focus and lose weight, and reducing cravings and appetite. Join our free community for moms who want support on their Keto journey! Click the image to join us! I loved reading this. I’ve done a lot of research on the Keto diet and I’m thinking of starting after I have my baby! Thanks for the tips! Hey Kelsey! I’m so glad to hear it! You don’t have to wait until you have the baby…it’s safe for pregnant and nursing moms 🙂 Babies are born in ketosis! Not doing Keto, but Gaps and this is all applicable. These are great tips to living the Keto liftstyle successfully. I love the salt tip. My husband struggled with the keto-flu when he first started and didn’t kmow why. Just jumped on the Keto train so these tips are right on time! I’ve heard so much about this diet. I need to check it out, because people rave about it!